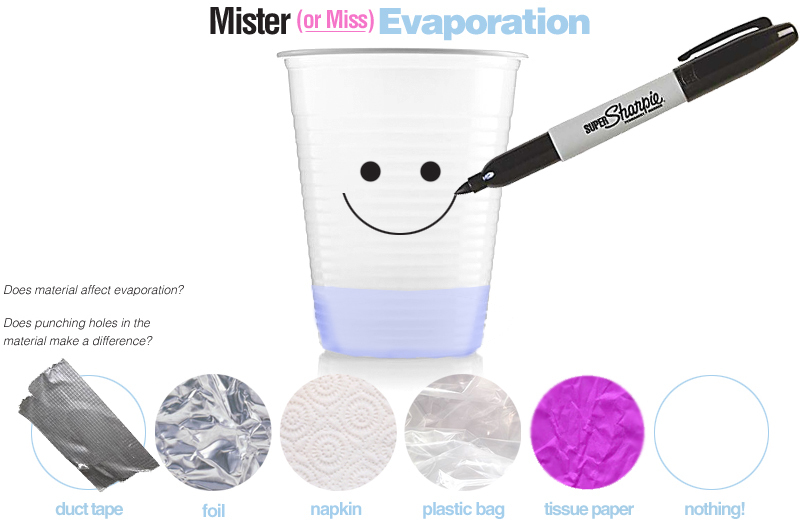 Have kids construct an Evaporation Cup Man or Lady! Check out Miss Klipfel's first grade evaporation project! Kids decorate a cup, add water, cover the top with a material (punch holes or not), and wait till it evaporates! They measure their "friend" and keep track of any changes. Does material affect how fast or slow water will evaporate? If you don't punch holes in your material, will it evaporate?! Have kids make a prediction. As a class, create a graph showing their predictions. See the experiment in action here! Where can I get a copy of the patterns for the lady or man cup? Love this for my 1st graders!